I'm on a condiment kick! First Lacto-Fermented Ketchup, and now Lacto-Fermented Honey Dill Mustard! Oh, the zip and zing a little mustard can add to a sandwich. 😉 My mouth waters just thinking about it. With a few minutes and a few simple ingredients, you can whip up this mustard in no time. This treat needs to sit out at room temperature for a few days to allow the flavors to meld and the whey to do its work. But don't worry — it's worth every moment! Enjoy on sandwiches, grilled meats, and as a flavor enhancer for dressings and sauces. A little bit goes a long way. Add ingredients to a bowl. Stir well. Pour mustard into a jar. Cover tightly and leave on the counter for 3 days before moving it to the refrigerator. Enjoy! *If using apple cider vinegar, this will not be lacto-fermented. Leave it out at room temperature for a few hours or a day, then move it to the refrigerator. Be sure to check out our Lacto-Fermented Ketchup and Lacto-Fermented Mayonnaise, too! Are you a mustard fan? 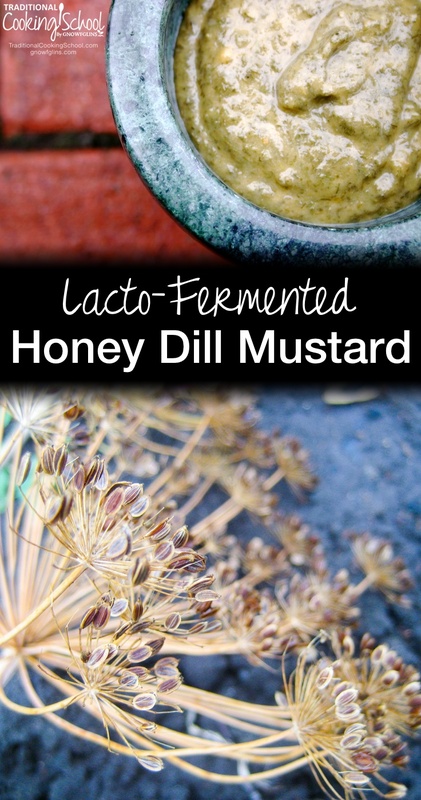 Have you ever tried Lacto-Fermented Honey Dill Mustard? This post was featured in 43 Fermented & Probiotic-Filled Condiments. This looks great! I have a ton of dill in my garden, so I’ll be trying it soon — thanks! Thanks for the great condiment recipes! I made the ketchup yesterday and loved the taste! (I can hardly wait till tomorrow, because I didn’t know if it was okay to open and use prior to the 48 hours!) I’m sure I’ll be eating more ketchup now. 🙂 I look forward to making (and eating!) the mustard. Karen- Yeah! So glad you liked the ketchup. 🙂 I hope you enjoy the mustard as well. It is definitely on the spicy side, because of the mustard powder. But, if you like a little zing every now and again, I think you’ll enjoy it! Milder mustard recipes soak and grind mustard seeds. Next time, for fun, I’ll go that direction. If I’m using the whey, do I also use the apple cider vinegar? I made the ketchup yesterday and was thinking that I needed to make Mustard to go with it. Thanks! I can’t wait to make it! These sorts of “cooking” projects are perfect with my 6 year old. I’m so glad to see this recipe! I have just started fermenting veggies (sauerkraut and 2 batches of pickles so far) and was wondering yesterday whether I could make mustard like this. Woo hoo! Something else to try! And something else to spring on my friends who are starting to do the same things – we are talking about having a “fermenting club” where we can all bring samples of what we are fermenting to share, and this would be a nice addition! Jenz- A Fermenting Club! What a great idea! How fun to be on this journey with a group of friends. 🙂 Enjoy the mustard, and if you enjoy tomatoes, be sure to give the lacto-fermented ketchup a try too! Delish! I made this recipe yesterday and while it’s amazing, it’s just WAAAAAAAY too hot/spicy for us! Any suggestions on how to mild it down, or what to use it on? I thought it would be great on fish or roasted potatoes, but we won’t be able to handle more than 1/16th teaspoon size servings. I guess I didn’t realize how hot mustard powder is! Thanks for the reply. All great ideas! Oooh, would love to try this, especially since I love things with a “kick”! I’ve been wanting to make a recipe for Spicy Guinness Mustard but wanted to know if I add whey can I ferment it. Will the spices hurt the fermenting process? Thank you. I actually decided to use kombucha from my scoby hotel in place of the vinegar intead. I’m brand new to the idea of traditional foods. I’m wondering about adding a bit of whey to some previously made, home canned mustard. I’ thinking just popping the lid, stirring in the whey and leaving it on the counter until it’s fermented. Am I missing something about the process? Michelle — Yes, you can do that. Use about 1/4 cup whey per quart, scaling up or down as necessary. I just started this mustard recipe and licked my finger when done mixing. Whew! One more day to ferment but good grief you’re not kidding about the kick! Like, eye-watering smell and near-wasabi level kick. Thinking it might be best used by combining with my lactofermented mayo to make it a bit milder. Thanks for this recipe! I love making my own condiments, and lactofermenting them is even better! My mainstay mustard for sandwiches and such these days is a whole-seed kombucha mustard that is delicious, but this will be a lovely addition to the condiment shelf in my fridge. Have you taken a peek at the three grainy LF mustards I recently posted. Those don’t have quite the hotness kick… a delicious kick of flavor, though. And I don’t know if you are a member, but in the LF e-course, there is a delicious recipe for a LF dijon. You could always give that a try, too! Enjoy, and thanks for your comment! Does Erin have a bog, website, Facebook page, Pinterest page, or anything else to subscribe to? I find myself using so many of her recipes! They’re wonderful! Hi Deb! Awww… you are so very sweet! I am glad you are enjoying my recipes. Beccah — You can use a veggie starter culture like Body Ecology or Caldwell’s. I absolutely love honey mustard, but also love dill pickles! I think this could be a great combination for a condiment for different sandwiches, but I would love to use this for corned beef as well! It sounds like such a great condiment with so many different uses. Thank you for sharing!